SAP TechEd 2010 – Are You Going? SAP NetWeaver Portal, enterprise workspaces… and Sweetlets! Events Calendar 1.2 for the SAP Portal Gets a Boost! From client request, we have just released the latest version of our SAP Portal analyzing solution, Click Stream 2.2. While introducing an iView recording feature in 2.1 was a good improvement for the application, adding a cool save reports feature takes the new Click Stream 2.2 up another notch. But for the final touch on this release, we integrated database support on IBM DB2. We are pleased with the results and Click Stream 2.2 is now ready for you to download! The next major events from DSAG are the DSAG Technology Days, February 15th- 16th, 2011 in Hannover, Germany. Sweetlets will also have a booth and looking forward to welcome you there. Just last Friday DSAG released the official agenda for the conference with all scheduled sessions and exhibitors. You can download from DSAG website. A very large, well-known consulting firm will now include a live demonstration of Sweetlets Pretty Poll and Events Calendar in their portal offering to potential clients. This joint presentation of Sweetlets business packages in their pre-configured SAP Portal solution is a better jump start for new clients, providing them with enhanced functionality – right from the beginning. Top iViews report. Take a quick glance at what iViews are hot…or not. The iView recording for Sweetlets Click Stream SAP Portal analytics business package has just been unleashed to the public. This valuable monitoring detail offers a one of a kind feature to the SAP NetWeaver Portal space, taking portal analysis and Click Stream to the next level. Finally uncover exactly which iViews are being used in your portal, where people click on these iViews, and by whom. 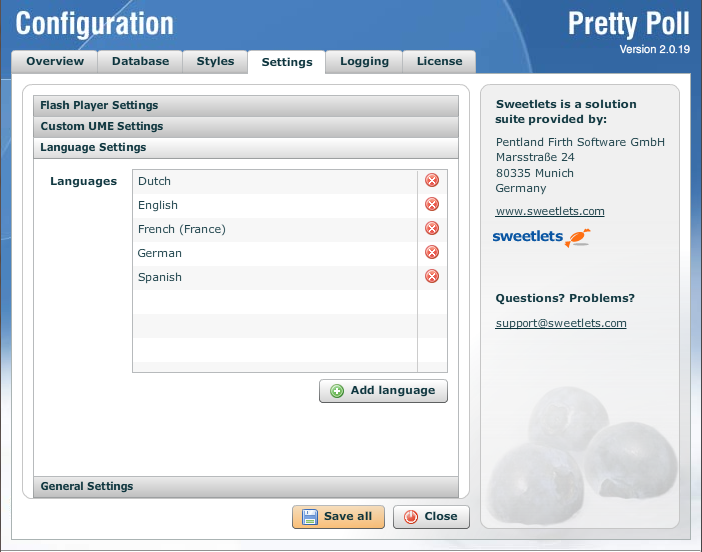 The handy Pretty Poll voting iView for the SAP NetWeaver Portal already offered a variety of end-user interface languages such as English, German, French and Dutch – but now includes Spanish and Italian. Choose from multiple languages to make voting more friendly to your users. 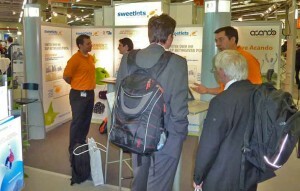 The DSAG (German SAP User Group) annual meeting will be held in Nuremburg from September 21- 23, 2010 at the CCN Congress Center – and here is your chance to meet Sweetlets in person. SAP NetWeaver 7.3 Beta for Portal – The First Successful Deployment of an Existing Business Package in SAP NetWeaver Portal 7.3 Beta Release? Just in! Mundipharma shares with us 4 eye-opening discoveries when they put Click Stream into action in their SAP Portal. We are happy to have Mundipharma share with us their story and shed some real life results from using Click Stream – and learn the importance of why you should analyze the usage in your SAP Portal.